Moben Global Inc rolled out a new kind of intelligent scooter K3 on its 2015 New Product Release Conference. Sometimes, some people who rode electric scooters appeared on the streets. When seeing most of them were standing on the scooters, others wondered whether they felt tired after long-distance trip. Of course yes. 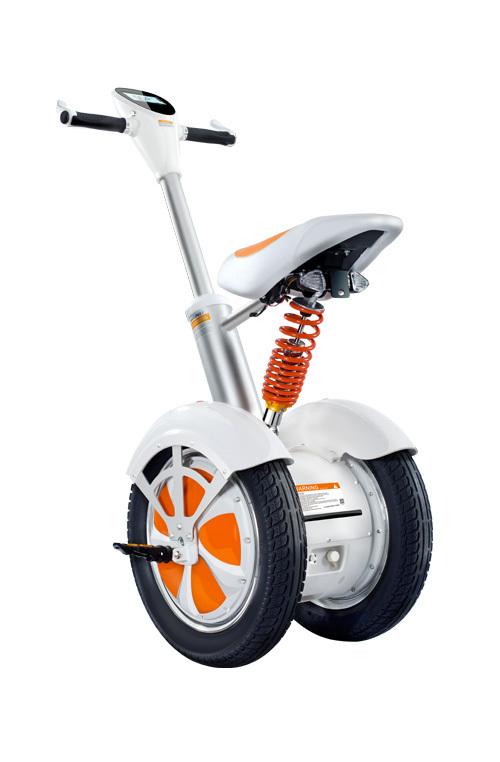 Different from former electric scooters, Fosjoas K3 is a sitting-posture electric unicycle. It is fashionable and provides users with a comfortable way of travelling. In appearance, the most attractive point of Fosjoas K3 is the sitting system. Moben designers firstly adopted the sitting structure in K3. And it helps users' outgoing more convenient and comfortable. Moreover, K3 uses the colors of white, silver and orange. The three bright colors make it appear energetic. The synthetic resin shells of K3 are made of aircraft-grade nano-materials. So it looks high-end. Anyway, all these design details make K3 seem to be perfect. Fosjoas intelligent scooters K3 have powerful functions as well. They use several 18650 SONY lithium batteries in parallel. The capacity of every lithium battery is up to 2600mAh, and capacity density is more than 5 times of traditional lead acid battery. As a result, K3 has a longer range and riders can go farther with it. In addition, some high technologies, such as the hydraulic suspension and electronic brake system, were applied to Fosjoas K3. The hydraulic suspension helps riders to sit on A3 more comfortable, while the electronic brake system makes trips with A3 safer. Following the fashion trend, K3 two-wheel electric scooters also has a dedicated App. Mobile phones can be connected to K3 by APP. After installing the APP, users can monitor any cycling data of intelligent scooters on phones. Fosjoas K3 is a great sitting-posture intelligent scooter. If one rides a Fosjoas intelligent scooter K3 on the streets, he must be the beautiful scenery on the road.